A Juvenile Risk Factor/Substance Abuse Curriculum Specifically Designed For Open Group/Open Admission! It’s a common problem– you need an outcomes-driven substance abuse program, but it is impossible to run the kind of closed groups that a truly effective program requires. That’s why we developed the OPEN TO CHANGE program, a state-of-the-art risk factor/substance abuse program for juveniles expressly shaped for flexible administration - and concrete results. This comprehensive open group program package— available in both adult male,and adult female versions— features a creative new approach: participants can be added to the group at any point, while the outcome-driven model provides structure and support for individual progress and change. This allows for open group and open admissions, while still providing a sequential approach to motivation and key concepts in substance abuse treatment. This resource is designed to be delivered in one-hour sessions and is provided in ten-session units. A typical program can consist of three to six units (30–60 program hours). The first 30 hours feature a CBT focus shaped for juvenile populations. The last 30 hours continue this focus with an emphasis on delinquency issues. For illustration, here is a typical 60-session cycle (six units). Participants may join the cycle at any point. Mid-program 1:1 sessions are supported by a variety of helpful tools. Each unit begins with Pre-Contemplation material and proceeds through Contemplation material to Preparation/Determination material. Rather than focus on “This is what drinking or drug use will do to you”, the critical goal is change - a commitment to making significant changes in their substance use/abuse. The key outcome of this change is increased and realistic self confidence in their ability to handle their highest risk factors. Unit A targets successful management of internal risk factors and difficult symptoms. Unit B focuses on successful management of external risk factors and triggers. 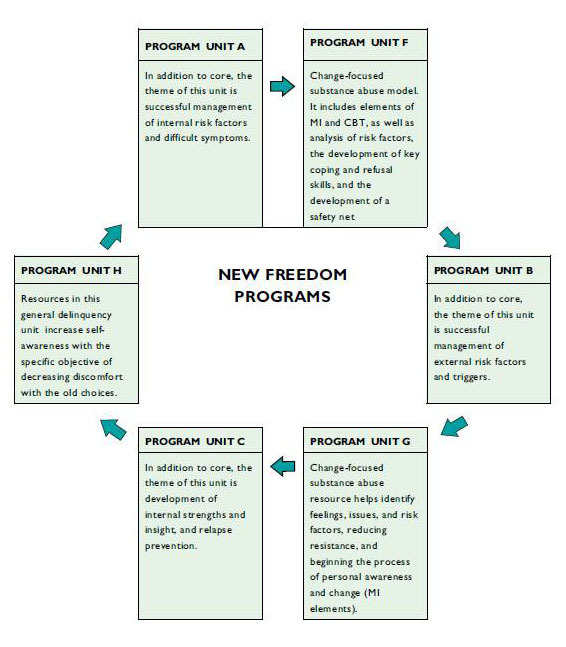 Unit C addresses the development of internal strengths and insight, and relapse prevention. Unit F includesanalysis of risk factors, the development of key coping and refusal skills, and the development of a safety net. Unit G helps identify feelings, issues, and risk factors, reduce resistance, and begin the process of personal awareness and change. Unit H provides a general delinquency unit to increase self-awareness with the specific objective of increasing discomfort with the old choices. This resource is also available in a Men's Version and a Women's Version. © 2019 A. R. Phoenix Resources, Inc.